May 10, 2018, San Jose, CA-- Thousands of girls and their families will gain hands-on STEM skills at Girls Day @ The Tech: Science Safari this Saturday. 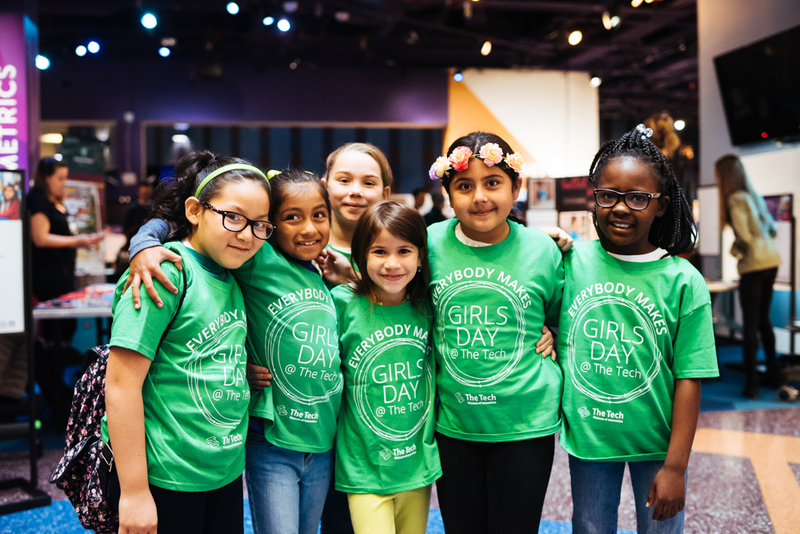 The Girls Day event series at The Tech Museum of Innovation inspires and empowers girls and their siblings to build confidence for careers in science, technology, engineering and math. Girls Day @ The Tech: Science Safari will focus on animal-themed engineering and science activities, after feedback from participants at previous events. Guests will engineer a device to rescue pandas in The Tech Studio, make animal shadow puppets with the Alum Rock Education Foundation, and learn about how owls hunt and digest by designing owl pellets with San José Public Library’s Maker[Space]Ship. Visitors will also have mentorship opportunities like meeting Dr. Shari Johnson, a veterinarian from Reed Animal Hospital, engineering ambassadors from San José State University and women leaders from tech companies. “This program is crucial to solving some of the challenges women face in the Valley. Not only are we making sure girls feel confident that they can pursue careers in STEM, we’re helping them recognize the tools they need for success,” says Joy Baker Peacock, past president of the Junior League of Palo Alto-Mid Peninsula and founding member of the Girls @ The Tech committee. Girls Day @ The Tech events are one of many Girls @ The Tech initiatives launched in 2015 with the help of the JLPA•MP, to build a pipeline of opportunities for girls that nurture their interest, boost their skills and solidify their confidence in STEM. The program also hosts an annual luncheon, where top women in tech share advice and some of their greatest accomplishments and challenges with a room full of community leaders and middle and high school students. This year’s Girls @ The Tech Luncheon on May 16 will feature Carol Bartz former CEO of Autodesk and Yahoo!, Aileen Lee, founder of Cowboy Ventures, and moderator Nita Singh Kaushal, founder of Miss CEO. “It’s inspiring to be part of a community that doesn’t question whether or not their daughters can pursue STEM careers, but rather what field they should enter and how we can all empower girls to grow up to solve big problems, “ says Singh Kaushal. Girls Day @ The Tech is a semi-annual event open to the public. All activities are included with admission. Visit Thetech.org/girlsday for more information. The event is made possible by the generous support of Gilead, Intel, Milligan Family Foundation, NetApp, eBay, Gregory P. Luth & Associates, Inc., KLA-Tencor Foundation, Schwegman Lundberg & Woessner, BNY Mellon, Arm, Bank of America, EY, First Tech Federal Credit Union, Hitachi Vantara, Mike Jacobson and Trine Sorensen, Mayfield, PayPal, SAP, Seagate, Peter and Renuka Relan, Mauria Finley and Greg Yap, Tim Haley and Ethna McGourty, in appreciation of Charmaine & Dan Warmenhoven, Cooley, IBM, PwC and Zoom. Additional support provided by Jami and Stephen Nachtsheim, Wayne and Janie Lambert, John and Barbara Glynn, and Dr. Myriam Curet. The Tech is a hands-on technology and science museum for people of all ages and backgrounds. The museum — located in the Capital of Silicon Valley — is a non-profit experiential learning resource established to engage people in exploring and experiencing applied technologies affecting their lives. Through programs such as The Tech Challenge, our annual team-design competition for youth, and internationally renowned programs such as The Tech for Global Good, The Tech endeavors to inspire the innovator in everyone.